The Nantucket “Crewel Whale” is an NHA exclusive design done on linen twill with DMC cotton and silver thread. 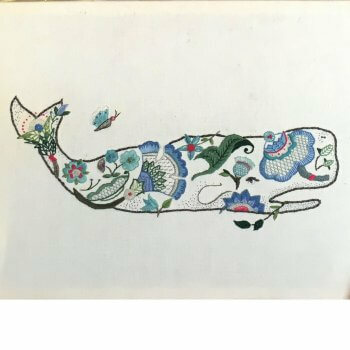 This design gives you the choice of stitching the model of interpreting the “Whale” in your own stitches. This is a challenge even for those experienced stitchers, but worth the effort! 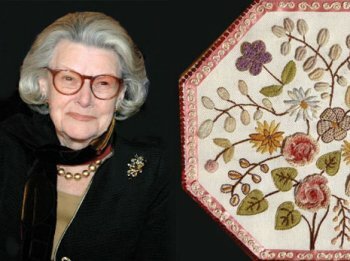 Edith Bouriez was principal needlework teacher for Erica Wilson for 20 years, managed her shop in New York, organized her Nantucket Needlework Seminars and taught workshops in a wide variety of disciplines nationally and internationally. She holds a teaching certificate in Crewel from the Embroiderers’ Guild of America, Inc. and has taught at their national seminar. From 1989, while living in France half of each year, she organized and taught extensively both in Paris and in the southwest of France. In 2009, she added knitting in cashmere to her agenda in Nantucket. A native New Yorker, she has been a summer resident of Nantucket for decades, owning one of the oldest houses for most of that time. She has taught a variety needlework disciplines at the NHA1800 House since 2007.